There are several important steps in purchasing a new puppy. First of you have to remember, and plan for the fact, that this new puppy is not really a pet but a member of the family. Once your children and you bond with this dog he or she is yours for up to the next 15 years. It is very important that you make your pick carefully and make sure you are getting just what you want. Cost, in this case, is not as important as other considerations. If you get a dog for free and are unhappy with it you will still have it for many years. If you pay more, and get just what you are after, you will never regret it. Buying a dog with a good pedigree does not guarantee you will get just what you want but it will certainly increase that likelihood. Spirit Labradors puppies all have excellent pedigrees. We breed using American Kennel Club registered parents with a great deal of field trial winners. That ensures our dogs will be highly intelligent, have good eyesight, will love to please, and have an innate desire to retrieve. You also need to consider the breeder and whether or not he or she has integrity and a desire to help you with any problems. Even the best bred dogs can have a variety of health issues so check the guarantee. We have a guarantee that covers all genetic defects and will either refund your purchase price or give you another puppy at your discretion. Of course, you should also talk with the breeder and get a feel for whether or not you can have a good relationship with him or her throughout the life of your pet. You want someone you can call with questions – either about health issues or training. We, here at Spirit Labradors, are available anytime, day or night, to talk about anything related to your dog. You can even just call us to commiserate when he chews up the garden hose. We also love calls when you want to celebrate his or her successes. So….. having said all that, what are the steps you will take? After you find a website check out the pedigrees and see if they are what you want. Look at the parents and see if they have the color and look you desire. Call the breeder and get a feel for how well you will be able to work with him or her. Pick out the litter you want. Remember that you really don’t pick a puppy, you pick a litter. If the parents look like what you want and the pedigree is there, you can almost close your eyes to pick one. The last pick of the litter will probably be as good as the first pick. It may be even better depending on the quality of your training. Call the breeder and find out how payment may be made. At Spirit Labradors you may pay via Pay Pal or personal check. The buyer pays the PayPal fees. Send a deposit to reserve your pick of the litter. If you order a while in advance you may get a higher pick than later. At Spirit Labradors people sometimes reserve a pup more than a year in advance. Our cost is 200.00 to reserve a pick. Stay in touch with your breeder to find out when pups will be born and how they are doing after they are born. Decide whether or not you will drive to pick up a puppy in person or have him or her shipped. We ship via air freight to anywhere in the country including Alaska and Hawaii and have never had any problems with the pup arriving on time and in good health. You pay the shipping costs which include the price of a small shipping crate (70.00 approx), the cost of air freight (about 350.00) and the cost of the vet check (about 25.00). Before your puppy is shipped, or at the time you pick up your puppy, you will finalize payment. 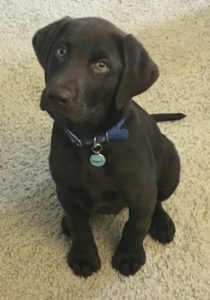 Your breeder should provide the AKC registration paperwork at, or near, the time you pick up your pup. We send the paperwork separately after the puppy is shipped. In some cases, the paperwork will come a couple of weeks later, depending on when the AKC gets those papers to us. Sit back enjoy this new member of your family!